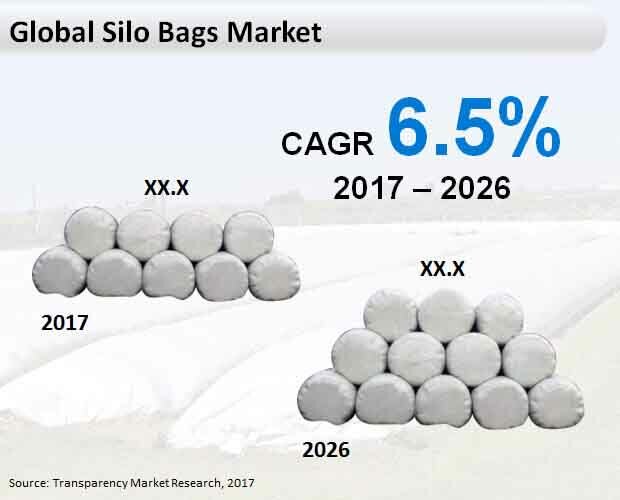 The global market for silo bags is prognosticated to witness a steady growth in the forthcoming years, as reported by Transparency Market Research (TMR). The manufacturers operating in the global silo bags market are expected to focus on new product launches with improved features over the coming years. An emerging trend among manufacturers and suppliers of silo bags is to leverage the changing demographics of farmer size. Manufacturers are increasingly addressing the demand from small farmers who prefer silo bags over capital intensive silo systems for storage purposes. Farmers with very short-term storage requirements prefer renting or leasing silo bags as silo bags have good reusability and longer product life. Some of the leading market players in the global silo bags market are GEM Silage Products, IPESA, RKW Group, BagMan LLC, Grain Bags Canada, Canadian Tarpaulin Manufacturers LTD, Temudjin Flex-Pack BV, Sigma AG (Sigma Stretch Film), Brain Chamber Polysacks PVT.Ltd, Hangzhou Xinguang Plastic Co., Ltd, and GrainPro Philippines, Inc. According to TMR’s report, the global silo bags market is expected to witness robust growth. The market is projected to register 6.5% CAGR during the forecast period 2017-2026. It is also projected to bring in US$ 693.2 million revenue by the end of 2026. In regards to application, silo bags are expected to be largely used for grain storage during the forecast period 2017-2026. Geographically, North America is expected to remain dominant in the global silo bags market during the forecast period 2017-2026. The global silo bags market is witnessing growth due to the growth in awareness regarding wastage of grains at the time of cultivation. The pressure on the production of agricultural crops is increasing owing to the rising population. Hence, the demand for silo bags is also growing as they can protect grain for a long time and help in meeting the ever-increasing demand for grains. The need for a cost-efficient solution for storage of grains and animal fodder has led to extensive preference for silo bags among farmers in the U.S. and Canada. The North America silo bags market is expected to witness healthy growth rate owing to small farmers demanding silo bags for short-term and affordable packaging and storage purposes. Rising demand for convenience packaging among new generation farmers has compelled the manufacturers of silo bags to innovate in terms of optimum space requirements, storage efficiency, high performance and flexible plastic sheets. Stringent guidelines issued by regulating authorities concerning food and environment have consequential implications on the silo bags market in North America. Stringent FDA regulations regarding the use of harmful chemical substances, and also various regulations for specific thickness, length and breadth for manufacturing of silo bags has led to market preference for alternative environment friendly products. However, growing demand for steel silos over bags may hamper the market demand for silo bags. This could be because steel silos are able to keep the grains safer as compared to the regular silo bags. Also, limited unitary capacity is provided by the silo bags which can adversely affect the market growth.